I found one of your web sites and just wanted to tell you thank you for creating it for others to read. I was aboard the USS Ranger and when Lieutenant Dengler finally returned to the ship. I was on the bridge standing just outside the CO's duty quarters so got to see him return to our ship that day so long ago. I had just delivered some top secret messages to the Captain and therefore got to see the Lieutenant return in person that day. Over the years my thoughts have returned to that time many times and now today I am so thankful to have actually seen one of our pilots return after such a hard experience he went through. I was sorry to learn he has passed away. And thank you for haring your photo with us of his grave. Dieter Dengler, a POW who escaped a Laotian torture camp during the Vietnam War and chronicled his experience in the book "Escape from Laos", has died. 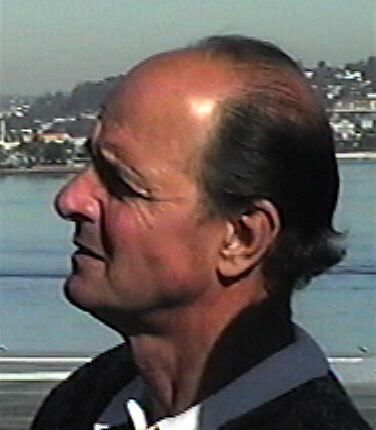 He was 62 and lived in Mill Valley, California. Dengler, who was awarded some of the nation's highest wartime decorations, was in the late stages of ALS, or amyotrophic lateral sclerosis, a degenerative condition commonly known as Lou Gehrig's disease, family members said. Dengler will be buried at Arlington National Cemetery near Washington, D.C., according to Russell and Gooch Funeral Chapel in Mill Valley. The date has not been set. 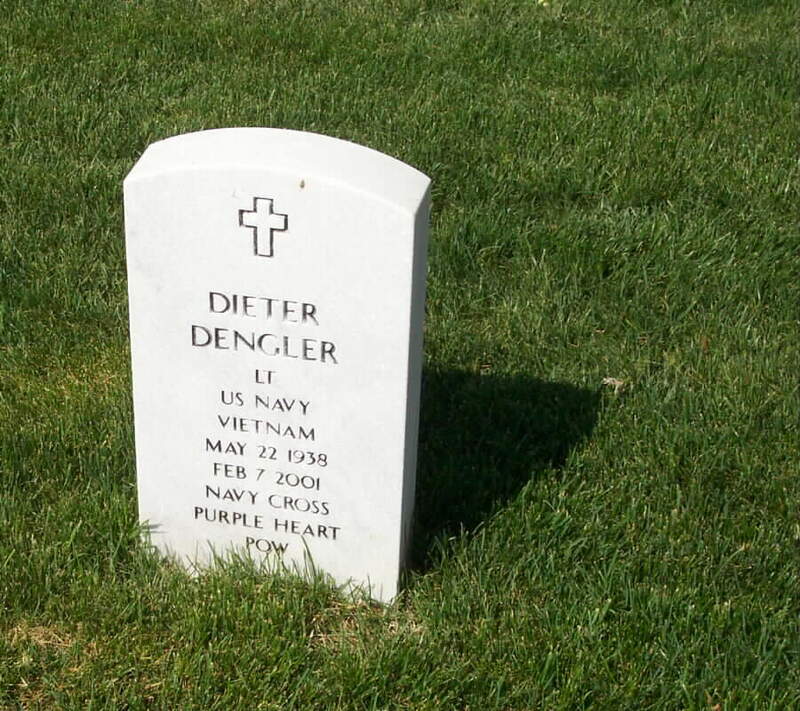 Dengler was a Navy pilot when his reconnaissance plane was shot down in 1966 over Laos near the Ho Chi Minh Trail. Captured by communist Pathet Lao forces, he was marched to a prison camp and tortured for five months. Dengler later wrote of being kicked, battered with rifle butts and dragged behind water buffalo. He also said his captors hung him upside down from a tree, covered him with honey and broke a nest of ants on his face. Ailing and withered to 90 pounds, he escaped through the jungle and was rescued by U.S. soldiers 23 days later. The Navy awarded him the Navy Cross, the Distinguished Flying Cross, the Purple Heart and the Air Medal. "People say it was a miracle," he said in a 1979 interview with the IJ. "I came out because I was meant to come out. I cannot say it was my doing. It's beyond strength to do something like that. Something, someone has to help you." Dengler wrote about his captivity and flight in the book "Escape from Laos," which was published by Presidio Press. A movie version of Dengler's life, "Little Dieter Needs to Fly," was made by German filmmaker Werner Herzog and screened at the Mill Valley Film Festival in 1997. The movie later appeared on Cinemax and was nominated for an Emmy in 1999. Dengler was born in Germany in 1938. His father was killed and the rest of his family fled the country during the World War II, according to newspaper accounts. He arrived in New York City in 1957, drifted to San Francisco and worked as a baker, a forest firefighter and a gold prospector before enrolling at the College of San Mateo and becoming a pilot. After the war, he was a pilot for Trans World Airlines. "He just explored the world and lived a full life," his wife, Yukiko Dengler, said last night. Dengler is also survived by two sons, Rolf Dengler of San Francisco and Alexander Dengler of Los Angeles; two brothers, Martin Dengler of Santa Rosa, and Klaus Dengler of Rottenburg, Germany; and one grandchild. SYNOPSIS: The USS RANGER was a seasoned combat veteran, having been deployed to Vietnam for Flaming Dart I operations. The carrier played a steady role for the remainder of American involvement in the war. The first fighter jets to bomb Haiphong in Operation Rolling Thunder came from her decks. The other aircraft in the flight could not determine what had happened. They only kne Dengler disappeared. Dengler later stated that ground fire had severely damaged his aircraft, and he was forced to crash land in Laos. Search continued all that day and part of the night without success. Ultimately, Dengler found himself in a camp in Laos held with other American POWs. One of them, 1Lt. Duane W. Martin, had been aboard an HH43B "Huskie" helicopter operating about 10 miles from the border of Laos in Ha Tinh Province, North Vietnam, when the HH43B went down near the city of Tan An, and all four personnel aboard the aircraft were captured. It is not clear if the four were captured by North Vietnamese or Pathet Lao troops or a combination of the two. Duane W. Martin was taken to a camp controlled by Pathet Lao. Thomas J. Curtis, William A. Robinson and Arthur N. Black were released in 1973 by the North Vietnamese, and were in the Hanoi prison system as early as 1967. On June 29, 1966, after hearing the prisoners were to be killed, Martin and Dengler and unnamed others (Eugene DeBruin was apparently part of this group, but was recaptured, and according to information received by his family, was alive at least until January 1968, when he was taken away with other prisoners by North Vietnamese regular army troops) decided to make their escape in a hail of gunfire in which six communist guards were killed. Dengler was seriously ill with jaundice, and Martin was sick with malaria. Dengler and Martin and the others made their way through the dense jungle surviving on fruits, berries, and some rice they had managed to save during their captivity. Dengler returned to California, and has written a book, "Escape From Laos" on his experiences while a POW. Curtis, Robinson and Black were released from Hanoi on February 12, 1973, over seven years from the time of their capture. Lt. Duane Martin's fate remains uncertain. If, as reported, he was killed during the escape attempt, no effort has been made by the Lao to return his body. Martin is one of nearly 600 Americans who remain prisoner, missing or otherwise unaccounted for in Laos. Although the U.S. maintained only a handful of these men in POW status, over 100 were known to have survived their loss incident. The Pathet Lao stated during the war that they held "tens of tens" of American prisoners, but they would be released only from Laos (meaning that the U.S. must negotiate directly with the Pathet Lao). The Pathet Lao were not part of the agreements that ended American involvement in Southeast Asia, and no negotiations have been conducted with them since for the prisoners they held. Reports continue to come in related to missing Americans in Southeast Asia. It does not seem likely that Martin is among the hundreds thought by many authorities to be still alive, but what would he think of the abandonment of his fellow Americans. Are we doing enough to bring these men home? Dieter Dengler resided in California with his wife Yukiko until his death after a long illness on February 7th, 2001. He will be buried in Arlington National Cemetery on March 16, 2001. The Navy Cross is presented to Dieter Dengler, Lieutenant (j.g. ), U.S. Navy (Reserve), for extraordinary heroism during an extremely daring escape from a Prisoner of War stockade on 30 June 1966. Playing a key role in planning, preparing for, and developing an escape and evasion operation involving several fellow prisoners and himself, Lieutenant (j.g.) Dengler, keenly aware of the hazardous nature of the escape attempt, boldly initiated the operation and contributed in large measure to its success. Christian Bale portrays the late Dieter Denglerin a new film Rescue Dawn. Dengler, who lived in Sausalito and Mill Valley, escaped from a prison camp in Vietnam and was rescued 23 days later. He was friends with the film s director, Werner Herzog. (IJ archive)German film director Werner Herzog made a promise to his friend, Dieter Dengler, a decorated Vietnam war hero he often visited at his home in Marin County. Herzog vowed to make a movie about his German-born compatriot's epic struggle for survival during the Vietnam War. After Dengler died of amyotrophic lateral sclerosis, or ALS, Lou Gehrig's Disease, in 2001, HerzogNew York Times visited his grave at Arlington National Cemetery. "Werner and Dieter got to be very close," Dengler's ex-wife, Irene Lam-Dengler, recalled this week. "Werner wanted to make this movie for him. When he was at Arlington, he said he still had some unfinished business." Herzog's business is no longer unfinished. He wrote and directed "Rescue Dawn," a new action adventure movie inspired by Dengler's harrowing true story. It will be in Bay Area theaters July 13. This is Herzog's second film about Dengler. The first, the documentary "Little Dieter Needs to Fly," was screened at the Mill Valley Film Festival in 1997. A fascinating character who lived for three decades in Sausalito and Mill Valley, Dengler had an extraordinary claim to fame: He was the only American flier ever to escape from a POW camp in the impenetrable Laotian jungle. Rescued after 23 harrowing days, he was emaciated, disease ravaged, wounded and lucky to be alive, albeit barely. With Christian Bale, the English actor who is Hollywood's new Batman, starring as Dengler when he was a young Navy fighter pilot, "Rescue Dawn" premiered in New York Monday and was screened the next night for members of the California Film Institute at the Smith Rafael Film Center. Members of Dengler's family were on hand for the screening, including his brother, Martin, his 24-year-old son, Alexander, and his former wife, Irene, who lives in Greenbrae. "Dieter was such an unusual person," she said before the Tuesday night screening. "He didn't make a big deal about himself. He was just another dad on the soccer field." Well, not exactly. Dengler had an amazing ability to make it through close calls. As a civilian pilot, he survived four other plane crashes. And, in 1979, he nearly drowned after he abandoned his sinking cabin cruiser in rough seas outside San Francisco Bay. The irony was not lost on him. "After escaping from that prison camp, I thought I was going to die a quarter mile from the Golden Gate," he said after he was rescued by the Coast Guard. That same year, his book, "Escape from Laos," was published by Presidio Press. In "Rescue Dawn," Herzog dramatizes the unimaginable horrors that Dengler and his fellow POWs endured at the hands of sadistic captors after he was shot down while on a mission to destroy Viet Cong strongholds in Laos in the early days of the war. The jungle scenes are so gripping and unsettling (starving, Dengler gnaws on a live snake and watches his buddy beheaded) they were hard to watch. Compared to idiosyncratic Herzog movies like "Fitzcarraldo" and "Aguirre: The Wrath of God," "Rescue Dawn" may be his most commercially viable and accessible feature film. "This polished, cleanly-made pic still packs a wrenching emotional punch and, if backed by critics and audiences, could earn more for Herzog than his last 10 features put together," Leslie Felperin writes in Variety. Richard Roeper calls "Rescue Dawn" "a film you won't soon forget." But BoxOffice magazine criticizes Herzog for offering "no new insights into the horrors of war." "Rescue Dawn" is being hailed in some patriotic quarters as an inspiration to today's troops, but that's something of a stretch for what is essentially an apolitical war movie. "Some of the reviews have been saying this is a political message about what's going on now in Iraq," Dengler's former wife said. "But the movie was filmed two years ago in Thailand. It is not a political film." Since Herzog is known as an arty director with controversial methods, his conventional Hollywood happy ending is somewhat surprising. The truth would have made a more poignant end to a pretty good movie. Herzog has Dengler's navy buddies sneak him out of his hospital bed, conning a pair of ludicrously stereotyped CIA agents, for a joyous celebration aboard his old aircraft carrier. As thousands of shipmates cheer and applaud, Bale, as Dengler, smiles and waves and looks like the handsome movie star he is. The truth is that the real Dengler was in terrible shape, suffering from malnutrition and a multitude of injuries and infections. According to his brother, Martin, speaking after the screening, once he was able, a debilitated Dengler was flown home to Hamilton Air Force Base in Novato for a reunion with his family and loved ones. "His feet were swollen, his teeth were missing, his hair was falling out, and yet he insisted on walking from the plane," Martin remembered. "He went through a lot of pain. You can't get that in a movie." It seems a terribly cruel twist of fate that after all he managed to live through, Dengler would die from ALS, an always fatal disease that slowly, inexorably made him a prisoner in his own paralyzed body. "He said his time in that prison camp was nothing compared with having ALS," his ex-wife said. "He said he could escape from the prison camp, but there was no way he could escape ALS. There was no way out for him."